I’ve been considering this term “ambient music” recently. In brief, the term and idea is usually credited to Brian Eno, with (sometimes) a nod in the direction of John Cage and also Erik Satie’s “Musique D’Ameublement”. The well-worn legend is that Brian was incapacitated in hospital and someone put on a record of some harp music but the volume was too low to properly listen to, and he was fascinated by his experience listening to the very quiet sounds and inspired to make music… um, intended to be backgrounded? I don’t know, I’m with him enthusiastically all the way up until he decides to make music that you are able to ignore, and then I wonder, okay, what’s the takeaway from that? So there’s this whole body of work built on an original idea that apparently few of its contemporary practitioners agree with or adhere to. Fine. I am not at all someone who wants my sound work to be ignored, but then I don’t call it ambient music. In tune with some of my other thoughts about sound, reminiscing about the above stuff got me thinking that maybe a couple of newer terms might be helpful. I’d offer these not as potential ‘genre’ names but just as something to consider. Categorizing music by genre is no longer useful anyway. The terms I’m thinking of are “inclusive” and “insular”. Inclusive sound would be that which combines easily with the surrounding sound of the listener. It’s not for ignoring, it’s for listening to – along with the naturally occurring, uncontrolled sound at the location of the listener. Headphone listening is not ideal with inclusive sound for obvious reasons. Insular sound is that which is its own sound world, capable of removing the listener from their surroundings, when you listen to it, the rest of the sound world dissolves away. Isolationism was a word that was kicked around in the 90s as a genre name, but I’d suggest that ~most~ music is intended as, and is used as insular sound in an isolating way. Sound canceling headphones are probably most ideal for insular sound, it gathers and amplifies the insulative properties of the music, buffering the audience against exposure to outside influence. A gathering of people might together inhabit the bubble that insular sound would provide, at a concert or a dance or something similar. The audience is collectively removed from the outside world by the music. Since I started of ruminating about the frustrating term “ambient” I’ll bring it back up again. If ambient is your thing, this might be an interesting metric to consider, since examples from this music seem to fall along a spectrum between the two poles. 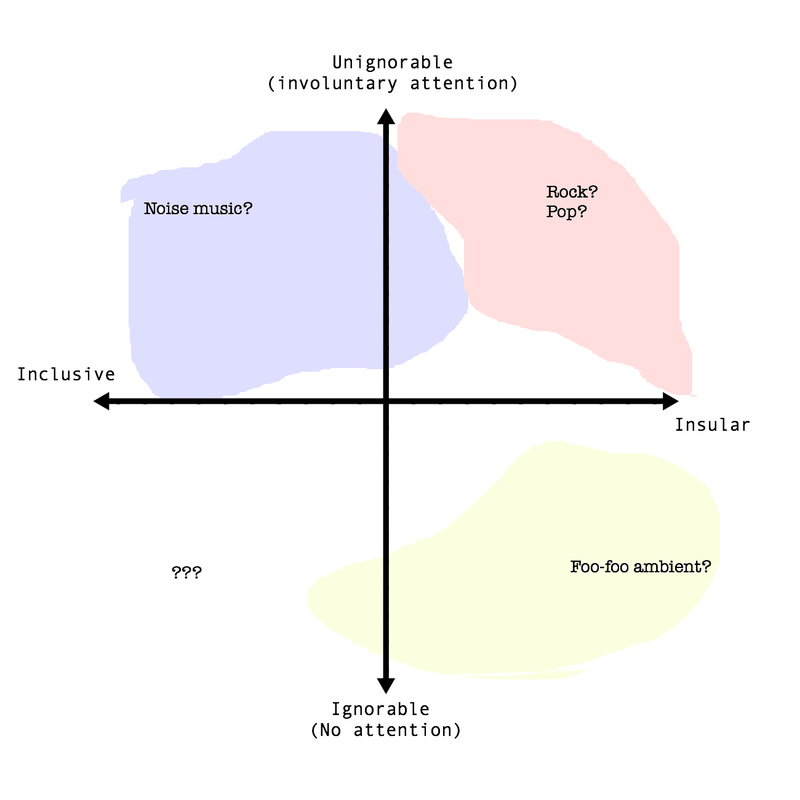 Noise music and many other ‘out’ varieties of music seem more likely to have examples that would fall into various points along a spectrum, rather than being conclusively one or the other. On the other hand, at least from my point of hearing, most rock, pop, blues, techno whatever – most explicitly rhythmic / melodic music primarily is of the insular category. I think it was Salome Voegelin who said that noise is sound that cannot be ignored. Because rock/pop/blues and other forms of popular music pulls the listener away from the real world into a pre-constructed reality, it could be said to be less ignorable. It’s probably more apt to be considered as noise by someone who doesn’t want to hear it. A lot of this kind of music is “noise” in the pejorative sense from my perspective: it’s hard to tune out. It wraps you into its sound-world, and I don’t necessarily agree to being enwrapped into that place. This is particularly problematic (at least in my view) when this type of music is encountered in so many public places that it could be counted as virtually ubiquitous. Whether something is ignorable or not might be an interesting thing to consider about inclusive or insular music, but ignorability cannot define them: these descriptors base themselves on active listening. I could envision an x-y graph with ignorable / unignorable at the poles of the x axis and inclusive / insular at the poles of the y axis. Attention slides up and down the x axis, at the ‘ignorable’ pole, there’s no attention, at 0 where the y axis intersects there is full attention, and at the ‘unignorable’ pole there is involuntary attention. These are really just ideas borne of idle contemplation, and not a manifesto that’s been thoroughly thought out… so if you have some criticism or suggestion (maybe better terminology?) and/or want to point out that someone else has already said all of this and way better than I have… then feel free to comment. These terms are subjective (maybe this is obvious.) Composer(s) may or may not have intended their music to fit into one category or another, and listeners may have differing thoughts on that matter. ** Blixa Bargeld said once that Basic Channel sounded to him like music to play at an expensive furniture store. Postscript: The fact that popular music forms such as pop / rock / blues / rap and others are commonly used as background music really needs to be integrated into this framework of thinking about how music is used. One aspect of “ambient” music (or the concept of it anyways) is the environment – the context. That is, the music becoming part of the environment, like the floorboards, or the painting on the wall – you aren’t paying attention to the things that make up your environment, but you are not ignoring them either. Not quite the center of attention, it’s just out of focus, perhaps. But, yet our environments influence us, they shape us. Our environment (and the music that is part of it) can be just as insular as it is inclusive. Sure, but these qualities are not inherent in the sound or the environment, they’re in the listener. The difference with music that led me to choose these terms was that music is intentional sound, environmental sound occurs with or without intention. I think you point out a flaw in the terms though, that the terms themselves implicitly exclude non-intentional sound. My bias is toward attempting to apply focused attention more of the time — therefore falling into this blurry, out-of-focus region you describe less of the time. @vuzhmusic People have tv or background music not to listen to but to give comfort in times of panic. In the Eno origin, I think the idea was to create music that functions like a fragrance, as an accompaniment to a contained environment rather than a focal point. So it isn’t just music not meant to be listened to but music that surrounds you, gently, such that you can listen and not listen as you like. Him being an art school student in the 60s, I’d also guess he was influenced by efforts in visual art, theatre around the time that was intent on breaking the fourth wall barrier between art and and audience. I like ambient as an adjective, less so as a noun. It describes a certain kind of quality of music. Whenever discussing the term with purveyors of the seashores and ethnic drums side of the spectrum, I used to explain that in my use of the word I meant ambient as in room. A lot of rigorously structured music seems to me to be presented as an object and intended to be observed in that manner. Whereas ambient music is necessarily less given to distinctive grammars, and tends to be for, or evocative of, rooms. There is a lot of music that bears ambient qualities, if seldom does it function according to Eno’s idea. I think maybe we’re in the same general area, thought-wise. Where I started with this line of thought was that a lot of what’s called ambient music is, a lot of times, very pointedly musical, and “evocative” (I might substitute “manipulative”) and doesn’t actually play nice with the naturally occurring ambient sounds, it’s ironic. @vuzhmusic Chris, wonderful post. Need to re-read and ruminate. It really is a difficult area to define, isn’t it? Just to throw out a thought, maybe it’s a matter of porousness–of music made deliberately porous enough to admit sounds external to it. That’s an interesting thought. Again, it’s important to stress that the qualities I describe are not necessarily in the sound itself, rather in the listener. This accounts for its subjectivity.